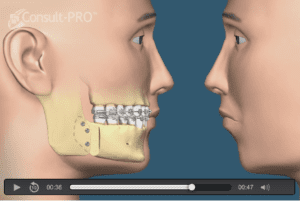 Orthognathic surgery involves repositioning the jaw or jaws to correct severe jaw malposition. Orthognathic surgery is needed when the jaws do not meet or grow correctly and/or the teeth do not fit (bite) together well. Teeth are straightened with orthodontics and corrective jaw surgery repositions a misaligned jaw. This not only improves facial appearance, but also ensures that teeth meet correctly and function properly. People who can benefit from orthognathic surgery include those with an improper bite or jaws that are positioned incorrectly. Jaw growth is a gradual process and in some instances, the upper and lower jaws may grow too much or too little. In some cases the jaws grow asymmetrically. This abnormal growth creates very difficult problems for the orthodontist to correct with braces alone, or the orthodontist may initially correct the bite but the result is not very stable and the bite correction may be more likely to relapse back into the original bite problems that the patient initially started with. Use of orthognathic surgery to correct the growth abnormality allows the orthodontist to have better chance of truly correcting the malocclusion for the long term. Usually patients that have this surgery have an improved self-image because they can see how the surgery helps their facial appearance look more balanced. Sometimes patients realize that they cannot chew certain foods well because of their bite. Yet, often they do not because they have grown up with this bite problem and they do not realize what a normal bite function feels like. Thus one should seek the opinion of a good orthodontist if recommended by your general dentist, even if you are not sure you are having a problem. Failure to correct a bad bite can result in a whole host of problems. A patient with abnormal chewing function can have jaw muscle and joint problems (TMJ clicking, pain, limited opening, bruxism, daytime clenching). Abnormal chewing function leads to wearing of teeth, teeth shifting, and abnormal bite forces on teeth that may lead to teeth fracturing. Most patients seek orthodontic treatment for esthetic purposes to level and align the teeth. This is only half of what the orthodontist treats. The orthodontist must also correct the bite. If the bite is not truly corrected the alignment of the teeth is often not stable and the teeth relapse back into the old alignment problems. Most orthodontic patients do not need jaw correction surgery, but there are some who clearly need this surgery to obtain a stable bite correction as well as improved appearance. Drs. Blecha and Jandali works with many fine orthodontists in this area who are well experienced in the diagnosis and management of these conditions. Seeking the help of the best orthodontist you can find is the best step for the initial assessment and management of a complicated bite/jaw problem. Any of these symptoms can exist at birth, be acquired after birth as a result of hereditary or environmental influences, or as a result of trauma to the face. Before any treatment begins, a consultation will be held to perform a complete examination with x-rays. During the pre-treatment consultation process, feel free to ask any questions that you have regarding your treatment. When you are fully informed about the aspects of your care, you can make an informed decision about the long term value of your treatment. Drs. Blecha and Jandali does use modern, CT scan computer techniques and three-dimensional models, if needed, to show you exactly how your surgery will be approached. Using comprehensive facial x-rays and CT computer technology imaging, we can show you how your bite will be improved and discuss how you will look after surgery. This helps you understand the surgical process and the extent of the treatment prescribed. Drs. Blecha and Jandali also uses CT computer technology to help plan the actual surgical movement which will occur. Our goal is to help you understand the unique ways that orthognathic surgery is used to correct your functional and cosmetic problems. If you are a candidate for corrective jaw surgery, Drs. Blecha and Jandali will work closely with your dentist and orthodontist during your treatment. The actual surgery can move your teeth and jaws into a new position that results in a more attractive, functional, and healthy dental-facial relationship.